Some stains will require a professional to get them out, but you can follow these guidelines for the best chances of spot and stain removal from carpet and area rugs. We would be happy to provide you with a bottle of professional spot remover at the time of your service. Immediately blot up as much of the liquid stain as possible using a soft, white, absorbent material like a towel or napkin. Though most of the carpets produced today come with stain-resistant treatments, no carpet can be said to be completely stain-proof. And longer the stain remains in the carpet, more permanently it is likely to be. Scrape away any solid or semi-solid parts of the spot using a blunt spatula or spoon. Never use a knife as it’s sharp edges could harm the pile fibers. Never scrub or brush a stain; scrubbing can harm the fibers and have the adverse reaction of making the stain set in to the carpet or rug. Vacuum away as much of the solid stain as possible. Pretest the spot removal agent on an inconspicuous area of the carpet. Follow the instructions carefully. Apply a few drops to each color in the carpet. Press a clean, white towel or napkin lightly over it for approximately 30 seconds. Check both the towel (or napkin) and the carpet for color transfer, color change or any other damage. It should be safe to proceed if there is no color transfer. To clean the spot, apply a small amount of spot removal agent to the soft, white, absorbent material and gently apply to the stain, working from the edges towards the center of the spot to prevent it from spreading. The goal here is to gently blot – no hard scrubbing! Continue as long as the stain is getting transferred onto the towel. Apply more solution to a fresh area on the towel and repeat the process as long as the stain is being removed. Patience is a virtue as far as this step is concerned! In cases where you need to apply more than one spot removal agent in a sequence, continue applying the first spot removal agent as long as there is any improvement; then move on to the next one. After the spill has been removed completely, rinse out the affected area with water and blot dry to remove the cleaning solution completely as any residue may attract soil and cause damage to the carpet. To effectively blot up the water, you may use clean, dry towels weighed down by flat, heavy objects like a book; keep changing the towel as they become saturated. Do not over-wet the area. Over-wetting of carpets while cleaning may cause damage to the carpet. For best results, read the guidelines above before proceeding. 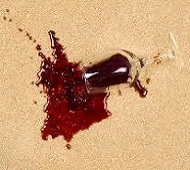 Failure to do so may cause permanent damage to your carpet! When using these Do-It-Yourself remedies, most heavy stains are best treated from the underside of the carpet. This will require that you disengage the carpet from the edge of the room. Treating heavy stains from the top may allow the stain to reappear over time. WARNING - Use caution to avoid sharp tack strips when peeling back carpet. Reattaching the carpet may require a professional. Use a non-flammable solvent-based cleaner or a liquid spot remover from the grocery store or hardware store. Use a solvent-type cleaner that is described by its manufacturer as being safe for nylon fabric or nylon carpet. Be sure to read and follow the label instructions regarding safe use, and never smoke or use an open flame in the vicinity of a solvent cleaner. Using wisk or beater, whip the solution until you have created a sudsy foam. It may be necessary to increase the amount of detergent to get enough suds to create a foam. Vacuum thoroughly to remove as much of the dry particles as possible. Use vacuum with beater bar and good suction. Once the stain is removed, place layers of white paper towel on the site to absorb any moisture. Weigh down the towels with a non-staining glass or ceramic object. You can let them sit overnight. These liquids can very rapidly permanently discolor carpet, so act quickly. Wear impervious rubber, nitrile, or thick latex gloves and use clean paper towels or white cloths to blot (do not rub) as much of the spilled dye as possible without spreading it. After blotting up the majority of the liquid, keep working with fresh clean toweling to blot up as much of the liquid that has penetrated into the carpet as possible by using your palm to press the clean towel into the carpet. Call a professional to remove as much of the remaining stain as possible. Concentrated dye can very rapidly permanently discolor carpet, so act quickly. Wear impervious rubber, nitrile, or thick latex gloves and use clean paper towels or white cloths to blot (do not rub) as much of the spilled dye as possible without spreading it. After blotting up the majority of the liquid, keep working with fresh clean toweling to blot up as much of the dye liquid that has penetrated into the carpet as possible by using your palm to press the clean towel into the carpet. Call a professional to remove as much of the remaining stain as possible. Use undiluted, but sparingly – too much of this product can damage the backing of your carpet. Use a vacuum hose with a small-area tool (not a beater brush attachment or a regular floor attachment) to pick up as much of the spilled soot as possible. We then recommend that you call a professional cleaner. Apply cleaning solutions sparingly. These solutions should be extracted to prevent odors from getting down in to the pad – where they are tougher to remove.